Stir the lemon zest, 3 tablespoons oil, 1 teaspoon oregano, 2 teaspoons garlic and the black pepper in a shallow nonmetallic dish or a gallon size resealable plastic bag. Add the shrimp and turn to coat. Cover the dish or seal the bag and refrigerate for 30 minutes. Heat the remaining oil in an 8-inch skillet over medium heat. Add the remaining garlic and cook and stir until tender. Stir in the lemon juice and remaining oregano. Remove the skillet from the heat. Add the butter and stir until the butter is melted. Keep warm. Prepare the bread according to the package directions. Cut each bread half diagonally into 6 (1/2-inch thick) slices. Heat the broiler. Place the bread slices onto a baking sheet. Broil 7 inches from the heat for 2 minutes or until the bread is toasted on both sides. 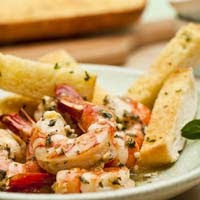 Remove the shrimp from the marinade and discard the marinade. Heat the broiler. Place the shrimp on a rack in a broiler pan. Broil the shrimp 6 inches from the heat for 5 minutes or until the shrimp are cooked through, turning the shrimp over once halfway through broiling. Place the shrimp onto a serving platter. Drizzle with the butter mixture. Serve with the bread. Garnish with the oregano sprigs. This entry was posted on 7:53 PM and is filed under Fish and Seafood . You can follow any responses to this entry through the RSS 2.0 feed. You can leave a response, or trackback from your own site.